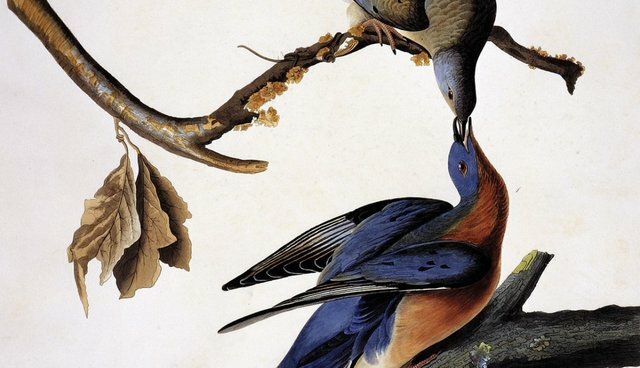 In his review of Joel Greenberg's book "A Feathered River Across the Sky: The Passenger Pigeon's Flight to Extinction," "The New Yorker's" Jonathan Rosen explains how the passenger pigeon could "vanish after near-ubiquity." The short answer is that it tasted good. Also, it was easy to kill and so abundant that it often seemed, in the days before refrigeration, like the quail that fell on the Israelites in Exodus. In 1781, after a crop failure, a flock of pigeons saved a large swath of New Hampshire from starvation. As long as America was rural and untraversed by railroads, the killing did not seem to do much more than dent the vast pigeon population. After the Civil War, however, things began to change rapidly. You could find out by telegraph where pigeons were nesting, get there quickly by train, and sell what you killed to a city hundreds of miles away....This meant that rural migrants to growing cities could still get wild game, and the well-heeled could eat Ballotine of Squab à la Madison, served by a new class of restaurant, like Delmonico's, in New York, where fine dining was becoming a feature of urban life. All this coincided with an explosion in logging, which began destroying the habitat of pigeons just as hunters were destroying the pigeons themselves. We did hunt the passenger pigeon to death, even if we didn't quite understand at the time what we were doing. We also might have saved it, at least in token form, if only our technological genius and our conservation consciousness -- two things that set us apart from other animals -- had come together sooner.